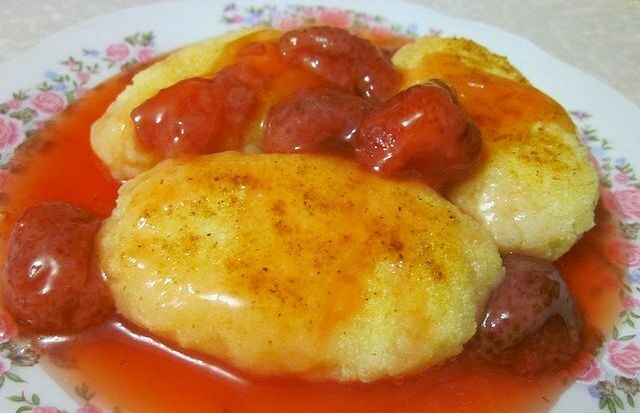 Prepare for Breakfast are delicious and very tasty dessert. Delicate semolina burgers will give you energy and good mood. To cook them is not difficult, and the products are all available. - 1,5 tbsp. of breadcrumbs. - a little flour and vegetable oil. - salt to your taste. - a little vegetable oil. Prepare the jelly. In a saucepan, pour water, boil it, add washed berries. Cook them approximately 5 minutes. While berries are cooking, pour the sugar, and stir. In a glass of water add 2 tablespoons of cornstarch, stir. Then in berry mass pour the starch and mix thoroughly. Make a thick jelly. Remove from heat. Cook the semolina. In the boiling milk, gently add cereal, stir, lumps should not be. Cook the oatmeal until completely dissolved the rump. Remove the porridge from the stove, allow it to swell and cool down. When the semolina has cooled, put it in a bowl, break there eggs, mix until smooth. Moisten hands, take a little monkey, form patties and roll them in breadcrumbs. Melt in the pan butter, put there received cutlets, fry them on low heat until Golden brown. Periodically turn it upside down. The finished dish serve with jelly. Wash the carrot, peel it. Rinse the apples, remove their core. Then thin strips slice the apples with carrots. In a saucepan heat milk, add butter and sliced carrots. Simmer for 5 minutes on low heat. Then put back the apples, semolina, salt, stir in the sugar. Continue to simmer for 3 minutes, remove the mixture from heat. Add eggs, mix thoroughly. Blind cutlets, roll them in breadcrumbs and place in a pan with melted butter. Fry patties for 4 minutes on each side until Golden crust. The finished dish serve with fresh cream. In the porridge, break the eggs, add the sugar. Stir well and form round patties. Then roll them in flour and place on a baking sheet (pre-cover the oiled paper). Bake patties until Golden brown at 180 ° C.
Serve the dish on the table with fragrant honey, condensed milk or sour cream. Cook semolina with milk and water. Then allow to cool slightly, mix well. Break there eggs, add salt, add sugar and butter, stir until smooth. Raisins rinse thoroughly, place in a bowl and cover with boiling water, leave for 17 minutes. Then carefully drain the water, steamed the raisins put in almost the dough for meatballs and mix. Gradually add to the flour and knead the dough. Then shape the meatballs. In a pan heat the vegetable oil and fry patties on each side until Golden brown.